GenreOnline.net: Sony Pictures Home Entertainment announced Insidious: Chapter 2 for Blu-ray release on December 24, 2013. Sony Pictures Home Entertainment announced Insidious: Chapter 2 for Blu-ray release on December 24, 2013. CULVER CITY, CALIF. (Nov. 4, 2013) – The famed horror team of director James Wan (Saw, The Conjuring) and writer Leigh Whannell (Saw, Saw III) reunite with the original cast in the highly-anticipated, spine-tingling follow-up, INSIDIOUS: CHAPTER 2, debuting Dec. 24 on Blu-ray™ Combo Pack and DVD* from Sony Pictures Home Entertainment. Fans can delve deeper into “The Further” with more than an hour of bonus materials exclusive to the Blu-ray Combo Pack, including a three-part webisode called “Insidious: Spectral Sightings,” which gives an inside look at the business operations of Specs and Tucker from their early days as paranormal investigators through their investigation with Elise. Cast and crew highlights are also included in the three additional behind-the-scenes featurettes available exclusively on the Blu-ray Combo Pack, including a discussion about making INSIDIUOS 2 and what it was like to film on a haunted location. Fans can unlock secrets from this suspense thriller through two additional featurettes available on both the Blu-ray Combo Pack and DVD. “Peripheral Vision: Behind the Scenes” takes fans onto the set of the film to see how it was created, and “Ghostly Transformation” follows the make-up effects used to create the ghosts in The Further. How deep into the darkness will you go to discover the truth? The terrifying sequel to Insidious, follows the haunted Lambert family as they seek to uncover the mysterious childhood secret that has left them dangerously connected to the spirit world. They must rely on familiar allies to exile the demons that follow them and unearth the secret before the evil continues its deadly rampage. Patrick Wilson, Rose Byrne and Barbara Hershey reprise their roles in the film directed by James Wan (Insidious, The Conjuring). Directed by James Wan from a story by James Wan and Leigh Whannell and a screenplay by Leigh Whannell, INSIDIOUS: CHAPTER 2 was produced by Jason Blum and Oren Peli. The executive producers are Brian Kavanaugh-Jones, Charles Layton, and Steven Schneider. 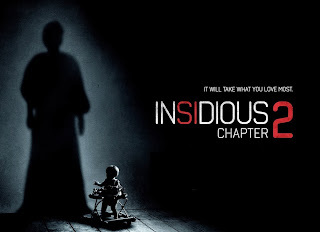 INSIDIOUS: CHAPTER 2 has a running time of approximately 106 minutes and is rated PG-13 for intense sequences of terror and violence, and thematic elements.